We’d love your help. Let us know what’s wrong with this preview of My Year in the Middle by Lila Quintero Weaver. In a racially polarized classroom in 1970 Alabama, Lu's talent for running track makes her a new best friend — and tests her mettle as she navigates the school's social cliques. Miss Garrett's classroom is like every other at our school. White kids sit on one side and black kids on the other. I'm one of the few middle-rowers who split the difference. Sixth-grader Lu Olivera In a racially polarized classroom in 1970 Alabama, Lu's talent for running track makes her a new best friend — and tests her mettle as she navigates the school's social cliques. To ask other readers questions about My Year in the Middle, please sign up. Lu is a middle school student in racially-polarized 1970 Alabama, who doesn't quite fit. She navigates through family, friend, and school dynamics while trying to learn about herself. This is perfectly written for the desired audience and covers so much in so little pages. Lu is a passionate, sensitive protagonist whose personality jumps off the page. This story provides a nuanced view of racism in history and sets a great example in showing young readers how to stand up for what is right in spite of doubts and peer pressure. My students are loving it!!!!! In reading Lila Quintero Weaver’s first foray into children’s fiction, I couldn’t help but think that this would pair well as a close analysis, keeping in mind Gloria Anzaldua’s border theory. To keep it simple, Anzaldúa believed that immigrants, especially Latinx, and more specifically those of Mexican descent, not just live with the trauma of immigrating across the literal border. The theory also refers to the borders that have been socially constructed, such as racial categorization and sexuality just to mention a few. I’ll apply her border theory to this text because I believe most of the book is a study of said theory. My Year in the Middle follows the last six weeks of Lu Olivera’s sixth grade in 1970 Red Grove, Alabama. Lu is the child of two Argentinian immigrants, which reflects the author’s own personal experience (this is explained at the end of the book with the Author’s Note). Lu considers herself to be a wallflower and does everything in her power to stay that way. But when the P.E. teacher decides that the girls will start running for the last six weeks of class, Lu becomes the surprise underdog. She outruns the entire class, which had been desegregated only the year before. In classrooms, however, an unspoken rule still divides Lu’s peers between black and white. Seeing as she identifies as neither, she occupies a seat in the middle row. In that way, she straddles a literal border. “A border is a dividing line, a narrow strip along a steep edge. A borderland is a vague and undetermined place created by the emotional residue of an unnatural boundary. It is in constant state of transition. The prohibited and forbidden are its inhabitants” (Anzaldúa 3). Thus, Lu becomes an agent of whiteness by not daring to mix with the black kids, even though she identifies more with them and wishes to befriend them. There is a border that she dares not cross, even though it’s not something her parents have taught her. Her parents have taught her to be implicit in white supremacy even though they don’t believe in it. When Lu finally decides to befriend Belinda, a black girl in her class who is also a fantastic runner, she worries about what her white peers might think of such relationship. She doesn’t hide it in public, and she defends Belinda in the face of a racist shopkeeper, but when she’s faced with the questions of her white peers she shies away from the courage she shows. It’s a slow process as she realizes the systems at play in her classroom, and though she has some help from white peers like her friend Sam, her “best friend” Abigail does the opposite and encourages Lu to assimilate. In fact, most of the characters who wish that Lu assimilate are women. If it’s not Abigail telling Lu to read women’s fashion tips in magazines, it’s Lu’s mom telling her that sports aren’t for girls when Lu expresses her love of running. This is a sentiment that even Anzaldúa expresses: “Culture is made by those in power—men. Males make the rules and laws; women transmit them” (16). By communicating that assimilation into a white heterosexual capitalist patriarchy or assimilation by ignoring your Otherness and that of your peers, Abigail and Lu’s mom transmit the messages of those in power, which Lu then internalizes. The book mostly consists of Lu unlearning these internalized feelings and the text does so deftly and with the innocence of a sixth grader who’s only starting to realize the depth of US’s injustices. A good evolution is the image of Lu’s sister, Marina, who’s a college student as well as a volunteer for the Brewer campaign. This campaign is another subplot that’s almost always occurring in the background of Lu’s life. At moments she believes she wouldn’t be affected by the campaign, which is against rampant white supremacist ex-governor George Wallace and desegregationist Albert Brewer. But the book takes you on a sort-of ride-along as she goes to a Wallace rally because Abigail just wants to participate in a cake walk. As Lu feels horrible when the speeches start and the Confederate flags start flying, she bargains with herself and others that she only went to appease Abigail be a part of something with her white peers. Lu doesn’t tell her black friends or her own family that she attended the rally, knowing it would be met with scorn, which means that she knew it was wrong. When her social studies teacher asks her to write an essay about her experience at the rally for bonus points, she does so, and gets full points while feeling guilty. That guilt is useless, however, seeing as it resembles the white guilt of her peers who want to rebel against the white supremacy in place at their school, but won’t do anything productive with it. It’s when Lu uses her guilt to defend her black friends that it becomes more productive. At a white student’s birthday party, Lu becomes the target of harassment from her peers for being friends with the black students, especially Belinda. White fear comes bubbling up, and it’s only perforated when Lu finally owns up to her own prejudices and by calling out her peers’ racism in the process. When Brewer loses the race, the sentiments explored in the book felt all too familiar. As the Brewer supporters start mourning the loss, the white Wallace supporters become even more assertive of their desire for white supremacy. The feelings paralleled the days after the election of Tr*mp. Keep in mind, the book is set less than 50 years ago, and the sentiments of white supremacy and segregationist laws are still present in the US. It is at that point that Lu’s reality comes crashing down on her. At school, she finally decides to sit with the black students, eschewing the created border of the middle row, the false neutrality she thought she could keep. Lu finally overcomes “the tradition of silence” that Anzaldúa wished to do in regards of the censuring of her identity as a Chicana (59). And though, again, Lu isn’t a Chicana, it’s the best turning point for her as she accepts her Otherness and doesn’t give into white supremacy. In fact, she goes to a white man in power (the principal) to defend one of her black peers, who’s attacked by a white student in class. Lu is constantly subverting the expectations set for her as the book moves along. She shows growth in the most hopeful and honest way. She’s constantly deconstructing the set default, though not always by herself, like in the scene in which Belinda is at her house and they’re going through the magazines that used to be Abigail’s. Belinda points out that there’s one black model for the overwhelmingly white publication, but she doesn’t worry because at her house they receive beauty magazines for black women. Lu can’t help but wonder that there’s no such thing for girls like her, girls from Latin America, and that she doubted she would ever find a black-haired model with brown skin. This scene is a short one, yet it puts into focus what has been set as the standard for beauty: Eurocentric features. It also helps as a way for Lu to deconstruct such standards, and to question why those are the default. “It is not enough to stand on the opposite river bank, shouting questions, challenging patriarchal, white conventions. [...] At some point, on our way to a new consciousness, we will have to leave the opposite bank, the split between the two mortal combatants somehow healed so that we are on both shores at once [...] Or perhaps we will decide to disengage from the dominant culture, write it off altogether as a lost cause, and cross the border into a wholly new and separate territory. Or we might go a different route. The possibilities are numerous once we decide to act and not react” (Anzaldúa 78-79). And indeed, Lu acts. Most of the book is her reacting to injustice, and by the end she’s acting and choosing her own path. She chooses herself, she chooses her real friends, and her family. She also chooses running, with her entire family supporting her and her dad and sister helping her train before the big competition (a Field Day). It becomes a celebration of Lu’s identity as her parents shout encouragement in Spanish as she goes. Those screams allow her to win, seeing as her competition, an older white girl, gets distracted and falls on a pothole. This final scene settles the border paradox within Lu. She’s able to celebrate both her passion for running and her identity as a Latina, all while celebrating the friends she has. There’s no indication she wants to seek reunification with the white peers who turned their backs on her, or that she wants to seek some sort of revenge. Anzaldúa, Gloria. Borderlands/La Frontera: The New Mestiza. Aunt Lute Books, 1987. Quintero Weaver, Lila. My Year in the Middle. Candlewick Press, 2018. Set in Alabama in 1970, the story takes place post-segregation but a racial divide still exists in the town and school. Lu just wants to make friends and explore her new interest, running, but will have to stand up to kids at school and even to her own parents. This is a story about standing up for what is right and finding the possibilities in that uncomfortable space. A really wonderful book that handles important historical topics through the eyes of a middle schooler. Story of a Hispanic girl during segregation. George Wallace running for governor. Lots of the white kids are going to a private school to be away from the black kids. The year is 1970 and Lu Olivera is a sixth grader who loves to do the things normal sixth graders do. Quite by accident she discovers that she likes running track. All around her however there is social upheaval, the effects of which are seen even at her school. As if that wasn't enough, her old friends have all started acting weird. Why can't things just stay the same? This book although set in time nearly 50 years ago is still relevant. Young readers can be inspired by the example of Lu. Somet The year is 1970 and Lu Olivera is a sixth grader who loves to do the things normal sixth graders do. Quite by accident she discovers that she likes running track. All around her however there is social upheaval, the effects of which are seen even at her school. As if that wasn't enough, her old friends have all started acting weird. Why can't things just stay the same? This book although set in time nearly 50 years ago is still relevant. Young readers can be inspired by the example of Lu. Sometimes the right decisions are not at all easy to make. This isn’t the first book I’ve picked up at TLA that focused on things like prejudice and bigotry, and yet these topics seem increasingly relevant these days. Argentinian immigrant Lu Olivera is in sixth grade and is facing new and interesting challenges, such as “my friends have discovered boys and makeup and I don’t see the appeal” and “I’m really good at this sport but the others mock me for it” and “I want to be friends with this girl, but she’s black and people will talk”. Okay, that last o This isn’t the first book I’ve picked up at TLA that focused on things like prejudice and bigotry, and yet these topics seem increasingly relevant these days. Okay, that last one is only a problem if you’re in 1970s Alabama…which happens to be the case here. We’ve achieved integration here, but already like half of the white parents are transferring their kids to a fancy all-white private school across town. Belinda is an African-American girl in Lu’s class, is a great runner, great friend, and gels excellently with Lu; even better than Lu’s current best friend, Abigail. Sadly, the problem is Alabama. In the 70s. Here, the black and white kids sit on opposite sides of the classroom, with Lu and a few others right in the middle. For those of us who are fully installed in the 21st century, the attitudes portrayed in the book are mind-boggling. And Weaver does an excellent job establishing these historical attitudes. We are treated to a scene of Abigail dragging Lu along to a rally for George Wallace, who is running for re-election. They only wanted to go for the cakewalk, because cake, but then Wallace comes out, Confederate flags a-blazin’ with racist rhetoric and ad hominem attacks on the current governor. The more Lu listens, the more unnerved she feels because she knows this isn’t right. That’s the heart of the story- finding the courage to stand up for what’s right and finding friends that will stand with her. Which side will she choose? Should she keep her head down and stick with the friends she has, even though they’re starting to buy into the white supremacist rhetoric? Or should she take the leap to the other side, with friends who want to change the status quo no matter what pushback they get? Thank you to Candlewick Press and NetGalley for an early review copy of My Year in the Middle by Lila Quintero Weaver, which will publish July 10, 2018. All thoughts are my own. Excellent middle grade level story about racial tensions in Red Hook, Alabama, on the eve of the gubernatorial election of 1970 (hint: George Wallace wins). Lu Olivera is a fabulous character — she is the quiet and unassuming daughter of Argentinian immigrants who finds her own voice and moral compass as racial tensions manifest in her town and her school. Lu is one of the few kids who “sits in the middle” in the classroom, with the black kids on one side and the white kids on the other. She finds a talent and passion for running and a new best friend — who happens to be black — to go along with it. As events transpire, and things occur which she knows is wrong, she wants to speak up, but running through her head is always her parent’s refrain: “We’re foreigners. We’re not supposed to get involved.” It’s both a history lesson and a lesson on the perils of conformity, being delivered to just the right age audience. The characters are real and absorbing, and the plot keeps you on your toes and is appropriate for the middle school audience. The characters are portrayed skillfully as kids who would rather focus on family and friends (and in Lu’s case - boys) than politics but who are reluctantly drawn into these issues nonetheless. Disclaimer: I was provided an eARC in exchange for an honest review. Thanks to Netgalley. My Year in the Middle is a new middle grade novel set in a fictional Alabama town during the 1970s governor primary race featuring known racist and segregationist George Wallace. Lu's family immigrated to the area from Argentina when she was young, like the author herself. Her school is now integrated, but in every class the white kids sit to one side, the black kids sit on the other, and Lu and other students--including the cute son of an anti-racist pastor, Sam--sit in the middle to show their solidarity. In this tension-filled environment where many of her former white friends are drifting away, planning to go to an all-white private school, Lu trains to win a race on field-day and her running buddy and new friend is a black girl. Weaver illustrates the time period well, from music and fashion, to Lu's vibrant voice filled with the cliches of the time, to microaggressions and more blatantly stated racist and sexist attitudes by adults and even fellow students. And yet, the comparison to attitudes of today are not far. Students today are most likely to socialize with those of their own race, and private schools and other options create the "white flight" we see in this novel. At one point, Lu attends a Wallace rally because she was promised a cakewalk and is horrified at the candidate's speech where he calls his opponent by an offensive nickname and talks an awful lot about, well, making Alabama great again. I found it interesting how Lu classifies herself as white, although a "foreigner," because today the United States has very different attitudes toward Latinx people, many of which are sadly not positive. Lu does face some of this, but it's also demonstrated that many don't see her ethnicity and read her as white--her gym teacher is surprised to discover she speaks Spanish, and she knows adults seeing her talking with a black boy will think she is threatened. Mostly, her conflict about speaking up comes in part from her mother's warning that people don't like when foreigners get involved. Still, the concept of "the middle" applies to her own identity, and this was such a unique perspective to read from. And yet, as a pivotal moment late in the novel demonstrates, being in the middle isn't enough. Lu discovers she has to stand up and speak out for what's right or justice won't happen. She could avoid humiliation and unpopularity if she aligns herself with the privilege of the white students (something marginalized ethnicities have done in the history of America), but she doesn't, despite how difficult speaking up can be. There is a LOT to think about here, and I kept reflecting on how this would be a fantastic book to teach with all the real-world connections. The politics in this book come organically and very much through the eyes of a sixth-grader who is also occupied with school, friends, a crush, and sports. Interactions with her peers--especially with black students she connects with over common interests in running and music--are political and stir up tension just by existing. Her older sister is an intern for the candidate running against Wallace, she has to pay attention to the race for her social studies class, and the parents around her talk about it. Her scope of the election relates to how the it can impact her sixth-grade world...that a lot of white people really don't want her black friends to go to school with her. AND there is another major plot thread throughout the book that I loved! Lu, inspired by Olympic Gold Medalist Madeline Manning, desperately wants to win a long-distance race on field day and convince her parents to allow her to run on a track team being formed for the high school, even though their cultural values have led them to believe she should focus only on school and that it isn't proper for girls to play sports. Plus, the older bully on the bus keeps talking about how his cousin is third in the state and will beat her. Lu pursues this goal with encouragement from her gym teacher and lengthy training sessions, first with her new friend, Belinda, whom she bonded with over their love for running in gym class, and later with her father's and sister's help. I loved that this emphasized all the hard work and small steps that go into accomplishing a larger goal, and the climactic race is worth it. I do have a couple of minor quibbles with this book, however. An essay, a poem, and a song play major roles, and I would have loved to see these actually included in the text to give more insight into the characters. For instance, I wasn't entirely sure what angle Lu took on her report on the Wallace rally and I'm still not sure, especially since essays today--even at the sixth-grade level--are much more than a recounting of events that I suspect was popular back in the 1970s. I also was a little conflicted of the treatment of Lu's friend Abigail in the story...there's an acknowledgement of the (white) privileges of fashion/glamor, and her tale is certainly one of conformity that sadly includes racism, but I wasn't sure how to untangle these observations in a way that didn't look down on her interest in boys and fashion. Perhaps because Lu also has a big crush? I think she just came across as a character without much depth and that certainly relates to her path to conformity, but it's all tangled up in a "silly" crush and so on. Lu is wise enough to see that Abigail likes him more than he likes her, and I don't blame her for being upset, but it veered pretty close to some anti-teen-girl tropes. Perhaps something else to talk about with readers. The knowledge and worldliness Lu has in comparison is definitely because of her different experience with racism and inability to fully benefit from white privilege, while Abigail can cast that aside and come away from the Wallace rally only caring about the cakewalk experience. Yeah, the more I think about this, the more her character development and lack of shades makes sense, and boys and fashion should be interpreted as an extension of that, rather than evidence for it. This was a NetGalley ARC given for free in exchange for an honest review. Set in 1970 amid a contentious Governor’s race in racially charged Alabama, Lu finds herself literally and figuratively ‘in the middle’. Seated in the middle row of class with black classmates on one side and white classmates on the other, she also navigates the world as the daughter of Argentinian immigrants. Great story that parallels current times. The politics in the early 1970s were interesting, and I can't think of another middle grade book where the characters care so much about particular candidates, but I think this is very true to the era. But I'm glad I kept with it because I don't know if it was me settling into the story or the writing itself, but after a few chapters the southern terms didn't feel as forced and I could focus more on the story being told. Readers will cheer for Lu as she starts to flourish in her track talents and witness her constant moral and ethical dilemmas of figuring out right from wrong and learning to take a stand. In one early scene Lu has just finished a huge race and two of her classmates want to her join them in a victory dance and she declines, telling them she's not good at dancing. "But that's not the real problem. What's really got me worried is crossing over a line I'm not supposed to cross, if people see me getting friendly with Belinda and Angie. I'm already on the outs as it is..." (pg. 35) Belinda and Angie are two of Lu's black classmates. We see Lu attend a rally for former govenor George Wallace (she's uncomfortable about it but is going with her friend for the cake) and doesn't think she's doing anything wrong by being there until she hears his racist and demeaning remarks in person. She's told the reader things that make it known she believes everyone should have the right to go to school together and enjoy the same things, but she also knows that for her popularity's sake she has to be careful about who she's friends with. Many might think that sixth graders don't have challenges. After all, they're only in elementary school. In this historical middle-grade novel, set in Alabama with racial conflicts in the race for governor (Wallace's last term), young Lu Olivera has learned she loves to run and is good at it! In the prep for field day given by her pe teacher, Mrs. Underwood, Lu nearly wins and is only beat by Belinda, a black classmate. Thus the ending weeks o Thanks to Candlewick Press for the arc of this book! This review and many more like it are available at Read Till Dawn . I don't know what it is about this book, but it's taken me literally six months to work up the energy to review it. Even now, I'm only doing it because it's worked its way to the top of my review calendar. Perhaps I've just read one too many books about desegregation in the South. It's an interesting topic, but there reaches a point where all these books about white girls learning to stand against racism for the sake of their one This review and many more like it are available at Read Till Dawn . Perhaps I've just read one too many books about desegregation in the South. It's an interesting topic, but there reaches a point where all these books about white girls learning to stand against racism for the sake of their one black friend become a little repetitive. That's not to say that My Year in the Middle is derivative or bad, because it really isn't. Weaver adds a very interesting angle by making her protagonist an Argentinian immigrant, because it adds a layer of complexity to the story that similar books don't have. I also feel like Lu and Belinda's relationship is very realistic, since they share a passion for running (definitely a hobby I have no interest in sharing!). Plus, the politics of the upcoming election and the racist mud-slinging are interesting (and hard) to read. I can't believe that the author's note says she didn't make them up. Also, can we just stop to acknowledge the fact that public schools in Red Grove, Alabama weren't desegregated until the 1969/1970 school year? That is ridiculously close to modern day. This book is set in 1970, but it feels like 1950 for all the racism Belinda has to face. Seriously, Alabama?! Honestly, My Year in the Middle is a great book. Looking back now, I think my reluctance to review it largely stemmed from the fact that I hate thinking about how much racism there still was just a couple of decades ago. It's a good book, though, well-written and entertaining while also thought-provoking. I definitely recommend it! Excellent own voices fictionalized memoir set in Alabama in 1970, just after desegregation. The more the book goes on, the more Lu discovers that the middle is a very uncomfortable place to be. This is the year where she discovers her love of running, finds new friends and loses old ones, starts to think about boys and finds, in the end, that she needs to make a stand. It's an eventful 6th grade year. I like that most of her battles are social ones, and that while she is hesitant in deciding how Excellent own voices fictionalized memoir set in Alabama in 1970, just after desegregation. The more the book goes on, the more Lu discovers that the middle is a very uncomfortable place to be. This is the year where she discovers her love of running, finds new friends and loses old ones, starts to think about boys and finds, in the end, that she needs to make a stand. It's an eventful 6th grade year. I like that most of her battles are social ones, and that while she is hesitant in deciding how to handle them, she learns a lot about being true to herself. The pacing issteady, and Lu's somewhat neutral social status (identifying as neither white nor black, with parents who view themselves as foreigners, outside the local politics) gives her an interesting perspective. The book is also chock-a-block with 1970s slang and music, something I think both kids and adults will find entertaining. All of the civil rights books I've read take place post Civil War through the 1960s. This book is set in the early 1970s in Alabama after all the states have desegregated. Alabama is still trying to turn back the clock. Ex-governor George Wallace, a segregationist, is running again against moderate Albert Brewer for the Democratic gubernatorial nomination. Racially, Lu is caught in the middle. Her family is from Argentina, neither white nor black. Her parent's philosophy is to stay out of the fra All of the civil rights books I've read take place post Civil War through the 1960s. This book is set in the early 1970s in Alabama after all the states have desegregated. Alabama is still trying to turn back the clock. Ex-governor George Wallace, a segregationist, is running again against moderate Albert Brewer for the Democratic gubernatorial nomination. Racially, Lu is caught in the middle. Her family is from Argentina, neither white nor black. Her parent's philosophy is to stay out of the fray, but her sister feels differently and volunteers for the Brewer campaign. At school the classrooms are divided. Blacks on one side, whites on the other and a single row of "noncommittals" in the middle. Lu is in the middle, along with her anti-Wallace friend Sam. When Lu discovers her talent for running, she befriends another fast runner who happens to be black. Then she innocently ends up at a Wallace rally with her friend Abigail and she finds herself being ostracized by everyone. All of her friends want her to choose a side. She's caught in the middle, when all she wants is for everyone to get along. It could be my age, but I found the political aspect of the story fascinating. When a book compels me to do a little more research about the topic, it's a sign that I enjoyed the book. I found myself wanting to know more about George Wallace and his views. The author did a great job with details. For example, when Lu's black friend tries on the headband that Lu buys, the cashier makes a racist comment about it. You really get a feel for the racism that still existed a decade after desegregation. I love the white kids in the middle who finally take a stand and move over to the black side of the room, knowing the consequences they might face. My Year in the Middle provides the reader a look at segregation in the south, during the 1970’s, from the view of a sixth grader. As a child it is hard not to be influenced by the political views of your parents. Author, Lila Quintero Weaver, does a great job of showcasing this parental influence while also introducing us to Lu’s classmates and their political and racial opinions. Lu Olivera is particularly confused, she is not black, and not white, but rather a girl from Argentina. She’s litera My Year in the Middle provides the reader a look at segregation in the south, during the 1970’s, from the view of a sixth grader. As a child it is hard not to be influenced by the political views of your parents. Author, Lila Quintero Weaver, does a great job of showcasing this parental influence while also introducing us to Lu’s classmates and their political and racial opinions. Lu Olivera is particularly confused, she is not black, and not white, but rather a girl from Argentina. She’s literally stuck in the middle as her classroom is divided by black and white. Lu doesn’t see color though, she sees her dreams, dreams to be the fastest female track star at her school. She befriends her African American challenger and together they train to dominate the track. But, others aren’t as friendly to Lu’s new best friend, as Lu sees firsthand the prejudices African Americans are up against as the senate elections heat up. My Year in the Middle maintains the childhood innocence while exposing the reader to segregation of the 70’s. Throughout the book, you cannot help but feel like you are living through the prejudicial events yourself as Lu loses friends to her new alliance, classmates transfer to the all-white public schools and TV’s are tuned to the election results. Weaver has detailed it all, even down to the campaign volunteering and election rallies in this mild, young adult, politically charged read. *A review copy of this book was provided to me via the publisher in exchange for an honest review. An entertaining story about friendship, following your heart, and courage. Lu sits in the middle row in Miss. Garrett's Social Studies class, white students on one side and black students on the other. It's 1970, racial integration in the school is still new, Wallace is running for governor, and Lu is caught in the middle. She is from Argentina, and sometimes feels like she does not fit in with either group. She is having issues with her old best friend, Phyllis; she does not understand why they An entertaining story about friendship, following your heart, and courage. Lu sits in the middle row in Miss. Garrett's Social Studies class, white students on one side and black students on the other. It's 1970, racial integration in the school is still new, Wallace is running for governor, and Lu is caught in the middle. She is from Argentina, and sometimes feels like she does not fit in with either group. She is having issues with her old best friend, Phyllis; she does not understand why they are not friend anymore since Phyllis started hanging out with Missy. Lu has been friends with Abigail since fifth grade, but is she really a true friend? Lu discovers she has a talent for running which brings her closer to Belinda, another runner from school, however, she is from the wrong side of the classroom. She is worried about socializing with her, will she be ostracized from the other students in class? Belinda is accepting of Lu, strong and supportive, a true friend. Will Lu be able to put race aside and accept her for the loyal friend she is? This middle grades book is a must read in my book! It also answers the questions lots of students ask me when we study the Civil Rights Movement: what about the other minorities? Were they discriminated against just like black people? It’s 1970 in Alabama, and Lu Olivera is stuck in the middle row of her 6th grade class. Her school recently integrated, so the black students sit on one side of the room, the white kids sit on the other side of the room, and the kids who don’t quite fit in with eith This middle grades book is a must read in my book! It also answers the questions lots of students ask me when we study the Civil Rights Movement: what about the other minorities? Were they discriminated against just like black people? It’s 1970 in Alabama, and Lu Olivera is stuck in the middle row of her 6th grade class. Her school recently integrated, so the black students sit on one side of the room, the white kids sit on the other side of the room, and the kids who don’t quite fit in with either sit in the middle row. Lu’s parents immigrated to America from Argentina, and she is the only kid in her class that knows Spanish. Lu is shy and has a few friends, but when the governor’s race heats up between Wallace (the governor in power when integration was forced on the state and focuses on “bringing back Dixie”) and Brewer (the liberal candidate who disagrees with segregation), Lu is forced to pick a side: white or black? Along with the politics, Lu is also prepping for a field day race, trying to figure out boys, and attempting to understand what makes a good friend. The themes of this book hooked me from the start. Lu is trying to come to terms with her heritage and identity in her current culture. She’s also learning about gumption and what it means to stand up for what you know is right, even when people try to stand in your way. This book is one that I’ll recommend my students read, especially during our Civil Rights unit. My Year in the Middle by Lila Quintero Weaver, 288 pages. Candlewick Press, 2018. $16. Language: G; Mature Content: PG (racism); Violence: G.
The year is 1970 and many people in Alabama wish desegregation had never happened. Segregationist George Wallace is running in the Alabama gubernatorial race. Racially, Lu is caught in the middle. Her family is from Argentina, neither white nor black. At school, blacks sit on one side of the room, whites o My Year in the Middle by Lila Quintero Weaver, 288 pages. Candlewick Press, 2018. $16. The year is 1970 and many people in Alabama wish desegregation had never happened. Segregationist George Wallace is running in the Alabama gubernatorial race. Racially, Lu is caught in the middle. Her family is from Argentina, neither white nor black. At school, blacks sit on one side of the room, whites on the other, and a single row of "noncommittals" in the middle. Lu doesn’t understand the fuss. Her best friend on the track team is black, but her white friend supports Wallace. She's caught in the middle, when all she wants is for everyone to get along. I found the political aspect of the story fascinating. There is a lot of information about the political process and the two gubernatorial candidates, one for segregation and one against. The author did a great job with details. You get a feel for the racism that still existed a decade after desegregation. I love the white kids in the middle who finally take a stand and move over to the black side of the room, knowing the consequences they might face. Set in an Alabama classroom in 1970 The Year in the Middle tells the story of a young girl named Lu Olivera while black kids sit on one side of the classroom and white on the other Lu Olivera is one of the few kids who sit in the middle. Lu Olivera is a sixth grader who wants to get along with everyone in her class, but Lu’s friends have been changing lately acting boy crazy and making fun of Lu’s talent for running track. Lu hopes to find a new friend in fellow track runner Belinda Gresham but in 1970 Red-Grove Alabama, blacks and whites just don't become friends. A segregationist ex governor George Wallace heats up his campaign against the current governor Albert Brewer! Growing tensions in both the state and classroom force Lu to no longer stay neural against the racial divide. Will Lu find the strength to stand up for what's right and will the others in her class follow suit? I give The Year in the Middle five out of five stars! An excellent follow-up to her superb graphic memoir, "The Dark Room." True to Weaver's own childhood experience (I presume) this book doesn't feature the gripping drama of the earlier book, but rather is filled with the subtleties and ambiguities of teen life under the pressure of changing social values. Chronology dictated that the first book documented the violent years of the Civil Rights movement, while this provides more of an inside look at the slow grind and less-dramatic conflict that at An excellent follow-up to her superb graphic memoir, "The Dark Room." True to Weaver's own childhood experience (I presume) this book doesn't feature the gripping drama of the earlier book, but rather is filled with the subtleties and ambiguities of teen life under the pressure of changing social values. Chronology dictated that the first book documented the violent years of the Civil Rights movement, while this provides more of an inside look at the slow grind and less-dramatic conflict that attended the integration of schools. As before, however, Weaver's character reflects Weaver's own unique experience as an immigrant - placed in white society in this country, but with the ability to understand and empathize with those show others would exclude for superficial reasons. At the same time, My Year in the Middle also escalates the earlier theme in Dark Room of how the protagonist must work with the cultural expectations of her parents in shaping her life to the contemporary American life. 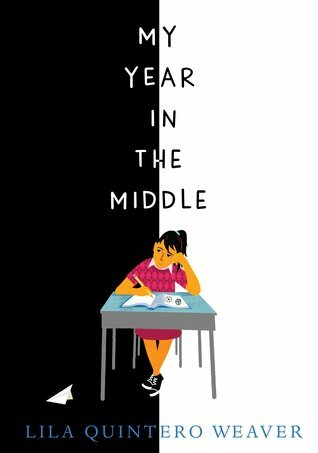 My Year in the Middle is the perfect title for this young adult book that adults will read, enjoy, and find illuminating. My Year In The Middle is a terrific Middle Grade book and one that this reader believes should be in the shelves of every classroom. Lu Olivera is a sixth grade girl who discovers a passion and a talent for running and a new friend who shares her interest. But her new running friend, Belinda Gresham, is black and this story is set 1970 Alabama during a time of racial tension. Lu opens the book by explaining that, "Miss Garrett’s classroom is like every other at our school. White kids sit on one My Year In The Middle is a terrific Middle Grade book and one that this reader believes should be in the shelves of every classroom. Lu opens the book by explaining that, "Miss Garrett’s classroom is like every other at our school. White kids sit on one side and black kids on the other. I'm one of the few middle-rowers who split the difference." Lu may be white, but she is also the child of immigrants, which in her town of Red Grove, Alabama means she’s different than most. It puts her not only in the middle row of her classroom but in the middle of a battle that’s brewing in the town. Lu has been taught not to rock the boat but things in Red Grove are escalating to the point where Lu has to choose a side. It is exactly this perspective of an outsider which makes this book ideal for schools and young readers. It’s a bit of a slow start but stick with it. You won’t be disappointed. June 1970 sees a shift in Alabama, one that re-amplifies the voice and ethos of George Wallace, a devout segregationist. Into this environment, Lu has to move from her position in the middle and take a side. Does she remain loyal to her white friends who will leave their public education and attend a private school so as to not have to attend school with black students? Or will Lu follow the path of her sister and her friend, Sam? Their path is the one of protest against segregationist values an June 1970 sees a shift in Alabama, one that re-amplifies the voice and ethos of George Wallace, a devout segregationist. Into this environment, Lu has to move from her position in the middle and take a side. Does she remain loyal to her white friends who will leave their public education and attend a private school so as to not have to attend school with black students? Or will Lu follow the path of her sister and her friend, Sam? Their path is the one of protest against segregationist values and with the goal of embracing everyone in their community. Throughout this cultural backdrop is Lu, an immigrant kid from Argentina who just wants to go to school, win first place in her track events, go to parties, dance with boys, and get good grades. Weaver creates a slice of life in this text, and she captures the angst of young girlhood, that confusing path of shifting friendships, and first feelings of tenderness for a boy. Lila Quintero Weaver's autobiographical novel tackles the subject of segregation. In 1970 Alabama, schools have recently been desegregated, and many folks are not happy. Lu, who is of Argentinian descent, literally sits in the middle row of her sixth grade class. This row of three or four students divides the white and black students in the class. Meanwhile, George Wallace is trying to become re-elected as Georgia's governor, and he wants to re-segregate the schools. Will Lu's friends and family Lila Quintero Weaver's autobiographical novel tackles the subject of segregation. In 1970 Alabama, schools have recently been desegregated, and many folks are not happy. Lu, who is of Argentinian descent, literally sits in the middle row of her sixth grade class. This row of three or four students divides the white and black students in the class. Meanwhile, George Wallace is trying to become re-elected as Georgia's governor, and he wants to re-segregate the schools. Will Lu's friends and family vote for Wallace? Also, many of Lu's friends are changing: they are wearing lipstick; changing hairstyles; and talking a lot about boys. But Lu is changing in a different way; she has discovered that she has a special talent for running. And through running, Lu has made some new friends on the other side of the middle.